The exciting tales of Harry Potter, the young wizard-in-training, have taken the world by storm, and fans just can't get enough of the magical world of Hogwarts and beyond. If you buy one of the Harry Potter books, we guarantee you'll want the next...and the next...and the next -- so why not have them all, right at your fingertips? With the Harry Potter Boxed Set (Years 1-7), Barnes & Noble.com offers simple one-stop shopping for your Harry Potter library! As easy as the wave of a magic wand, you can get all seven Harry Potter books delivered to your doorstep at once. 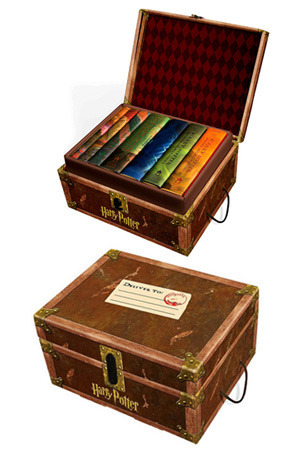 The Harry Potter Boxed Set includes hardcover editions of Harry Potter and the Sorcerer's Stone, Harry Potter and the Chamber of Secrets, Harry Potter and the Prisoner of Azkaban, Harry Potter and the Goblet of Fire, Harry Potter and the Order of the Phoenix, Harry Potter and the Half-Blood Prince, and Harry Potter and the Deathly Hallows. The books come snugly packed in a decorative, trunk-like box with sturdy handles and a privacy lock -- and includes decorative stickers! So buy the set, and not even a pesky Locomotor Mortis spell cast by the evil Lord Voldem...(oooops, sorry -- He-Who-Must-Not-Be-Named) can get in the way of your enjoying all of the mystery, adventure, intrigue, and, of course, magic that Muggles around the world can't seem to get enough of. Hold on tight -- it's going to be a bumpy ride!